Scottish artist Clifford Allan Russell (1919-2003) first came to Suffolk during army training for D-Day in World War Two. He managed to paint during the allied advance, peering from his tank turret, but was injured in action and used a wheelchair for the rest of his life. 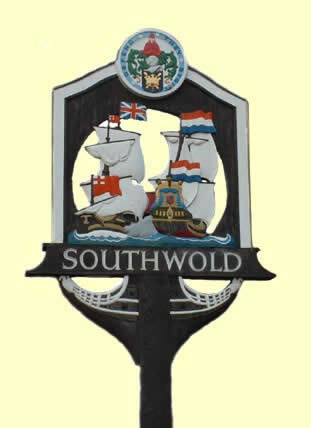 Russell designed the Town Sign, made to celebrate the Festival of Britain in 1951. He also painted inn signs for local brewer Adnams and, in 1955, with Nicholas Loftus, he founded the society that later became the Southwold Art Circle, which thrives to this day .